From time to time newspapers report that an effort is to be made to improve footpaths (sidewalks, pavements) to benefit pedestrian movement. In 2005 and 2006 such statements came from the office of the Commissioner, BMP. In 2007 the Deccan Herald reported that the Additional Commissioner of Police (Traffic & Security) had announced work on, ‘a policy dedicated to construction and maintenance of footpaths’. There is hardly any evidence on the ground of results from either initiative. Any such initiative needs commitment and a well-prepared approach to deal with the large variety of encroachments and misuses that have been allowed to develop. A well-formulated policy is needed to underpin the approach, and commit manpower and resources. The approach has to start with a list of the types of encroachment. Quick-fix solutions are not available for many of these. Staff entrusted with the mission will find it impossible to deal with many of the important types of encroachment without well thought out rules and the support of the bureaucracy, the political establishment and local communities. Otherwise any effort will deteriorate into a cosmetic effort that leaves the underlying sores untreated. Here is a list of types of encroachment compiled from observation and the accompanying nuances. Hawkers occupying part or whole of the width of the pavement. This is likely to be the first type of encroachment to be tackled, often by strong arm methods. In many cases the hawkers have become long established features of the locality, and are well patronised by the local community and/or visitors who find the services convenient. But the nuisance effects begin to dominate, especially when more hawkers come to exploit the situation, and action needs to be taken to eliminate or regulate the activities. What should be done? Eliminate the encroachments completely? Or allow them in a regulated manner? And if the latter, what rules need to be followed in order not to give room for accusations of discriminatory action, collusion or corruption? Many such encroachments are of long standing, and the ‘party’ is seen as providing a desirable service or amenity. Fruit and vegetable stands and cobblers are common. In such cases, provided the pavement is of sufficient width, activities selected in consultation with the community, can be allowed in carefully designated locations. They should be bound by an agreement to vacate the encroachments, at adequate notice, if pedestrian convenience so requires. In order to give an incentive for them to vacate on their own, a monthly rent can be charged, which will be increased rapidly over the years. The parties can also be given the responsibility to maintain the pavement in clean condition, and report any likely new encroachments so that action can be taken to stop them before they develop. Shops encroaching on the pavement through awnings, display structures etc, impeding passage of pedestrians. There is no question that these should be removed, and therefore it should be easy to apply. There is another type of encroachment by establishments, which is more insidious. This is caused by eating establishments, in front of which customers congregate. Even if structures such as tables and chairs are removed, customers buy things from inside and consume them on the pavement, causing hindrance to passers-by. In most instances, customers are men, and women pedestrians hesitate to walk through. It is clear that special efforts are needed to remove such encroachments, and prevent them from reappearing. It may be a good idea, in general, to draw two (yellow!) lines along the pavement to delineate a corridor within which people should not stop for any length of time, or congregate in small or large groups, for whatever purpose. The corridor will be for movement. This is an innovation which will need publicity and inculcation in the public over time, but there is no reason why it cannot be successfully implemented. Perhaps worse than the above, is encroachment by vehicles on pavements in front of establishments providing repair or installation services to two and four wheelers. It is not only that passage is inhibited, but it is also made hazardous by oil patches, nails etc. This is the most blatant example of public space being despoiled for private gain. There can be no compromise on this type, even though it may be claimed as a desirable service. Pavements are for people only, not for vehicles. The offending parties may be given time, say one year, to make alternative arrangements for the services component. The establishment may continue as a sales outlet. In most cases the parties will have made profit for many years while using public space as their own, so there will not be any injustice in requiring them to move. Monthly rentals climbing steeply every three months or so can be levied, giving an incentive to early vacation of the encroachment. In addition, the establishment should be required to repair the pavement to proper standards. Establishments such as the above abound in smaller streets that have no pedestrian pavements or identifiable walkways. These occur in residential localities, and many have been allowed to operate with impunity for years. They create great hazards to pedestrians, and need to be removed. But that will not be easy, because the owners are likely to be residents of the locality, and might have acquired ‘muscle’ – social, economic and physical – over time. These will be hard nuts to crack. The rate of vehicle ownership is rising rapidly, so a good percentage of the local residents may be making use of these establishments. But as localities get more crowded (building permits are being given with very little thought to the services that will be demanded), the need for these services will increase, and at the same time the space available will become less. Therefore there is urgent need to develop a policy for designation of areas where services can relocate. Ultimately, no establishment should be allowed to come up that will need to encroach on public space to provide its services, or that will create pressure on space that will be required for easy movement of people and vehicles, and the regular needs of the local residents, particularly parking. Large establishments, and in pre-dominantly residential areas, houses have been allowed to be built with their base level at a considerably higher elevation than the pavement, and they have built sloping approaches from the street, interfering with the walkway. It is particularly distressing to see such blatant hazards to pedestrians caused by public institutions such as banks. In many cases vehicles, particularly two-wheelers, are parked on these sloping approach, making it even harder for pedestrians. These encroachments, where ramps are built from the road to the base level of the building, will be very difficult to deal with. Each will need an individual approach, to work out in collaboration with the party a feasible solution. Participation of senior ward officers may be necessary. Where possible, the ramp should be relocated to be within the premises. Where this is not possible, the possibility of reducing the slope, and providing sloping approaches to the ramp from the two sides, can be considered. The party will have to bear the cost, and can be given time to implement it. Vehicles parked on the pavement are a major menace on streets with broad pavements. While some drivers might argue that they leave enough room for pedestrians to walk, most drivers seem to have no compunction in effectively blocking passage and forcing pedestrians to walk on the street. A particularly irritating practice is for a car to be left on the approach in front of a gate, across the pavement, blocking pedestrian passage. harassment to pedestrians sooner or later, and will be hard to regulate. The possibility of creating parking space for one or two four-wheelers, or a number of two-wheelers by short indentations into the pavement can be considered. (This has been observed in some cities in the west.) It would be best to reserve each indentation separately for two-wheelers and four-wheelers. In some localities, regular parking by residents in such indentations can be permitted. In others, particularly those which are, or might be allowed to develop into, shopping stretches, monitoring to prevent permanent obstruction will be needed. Parking vehicles on the pavement, completely blocking pedestrian passage, is widely prevalent. On these streets, other encroachments such as shops extending on to the pavement, and vehicle repair activities are also quite common. There is no alternative to completely eliminating these encroachments. A determined effort to clear the encroachments will be needed. Parking can be regulated by reserving one side of the street for parking, and permanent parking can be permitted. Another type of hazard is created by the practice of hosing down cars in the driveways of buildings, allowing water to run across the pavement and create pools along the road edge. It is not only that a pedestrian cannot walk across the approach, but the person will have to walk on the road well away from the edge of the pavement, with increased danger. Wastewater from eateries allowed to flow across the pavement is a common sight. Awareness that such practices are undesirable has to be created by a publicity effort. Later, penalties may have to be imposed for continuing violations. A most distressing misuse is a stretch where there is a wall or fence delineating the pavement, and this stretch is used as an open air latrine. It is an indictment of a society and civic institutions which do not provide for a most basic need. This is one of the most difficult situations to deal with. The solution would appear to be to build a public convenience in the vicinity; first a suitable site will have to be found, and then the funds for it. If the site is close to a number of commercial establishments, they may be willing to chip in with a part, if not the whole, of the funds. (For example, this could be the case in Malleswaram, on Margosa Road, between 9th and 10th crosses.) In some neighbourhoods, even households may be willing to chip in. If such help cannot be found, funds will have to be provided in the BBMP budget. Efforts will need to be made to see that the situation does not recur. One can see a society in its most thoughtless aspect when temporary structures are put up on public spaces to ‘celebrate’ a religious event, a marriage or a function. There is definite cause for despair when such impediments to passage of pedestrians are created by the well-to-do, and by parties professing to work for the good of society. It is only the police that can act in such cases. They will need to be sensitised to the problem; they should be authorised to act on their own, and instructed to act promptly on complaints from the public. It would be best that anyone wishing to put up any structure on public space should seek permission from the concerned police station or ward office. There should be clear instructions on what can be permitted. The party should be required to take down the structures and restore the road/pavement surface adequately. Perhaps a deposit should be taken, and this should be retained if the party fails to do adequate restoration. Construction material and debris blocking the footpath and/or making it hazardous to walk on the footpath, is a common sight. Such hazardous encroachment of public space is committed during construction of residential houses, and large commercial complexes. Even after completion of construction, debris is left uncleared, and no municipal authority seems to have the will to take the offenders to task. One cause may be ineffective implementation of rules regarding offsets of structures from the property boundary, or perhaps absence of adequate rules. It is desirable that approval for construction should be given only after vetting the plan for storage of construction material. In addition to approval of building plans, there should be requirement for approval of construction plans. Presumably there are procedures for approval of how construction power and water are to be drawn. Also included should be approval of the plan for storage of material in such a way that it does not impede or cause danger to, pedestrians. At least in the case of apartment buildings and large constructions, the builder should provide a covered walkway if material is likely to fall on the footpath from above. Electricity and water supply authorities put up structures on footpaths which make conditions hazardous for pedestrians, even when not completely blocking passage. These are perhaps overlooked because they supply essential goods, but they harm another essential, safe passage for pedestrians. Seven welfare groups based in the neighbourhood of Shankey Road came together under one roof to protest against BBMP’s plan of widening Shankey Road. 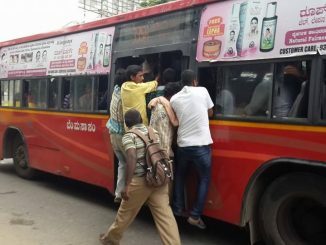 Commuting to Whitefield via bus is a nightmare. The push for commuter trains to Whitefield is gaining strength, but Vaidya wonders whether the trains could be punctual. Another problem with Bangalore sidewalks seen if the sidewalks are particularly large and easy to use for pedestrians, invariably two-wheelers also think so!! So many two-wheelers get on the sidewalk without consideration to pedestrians, especially where there are traffic jams. Its good to see citizens taking up such issues. I would recommend that you consider asking the Municipal authorities for design standards for pedestrians. There are several standards available around the world that consider regular activities such as vendors, parking, proper signage that doesn’t impeade WALKING. My guess is that the city does not have proper standards therefore are not enforcing them. Secondly, the City shouls conduct a ‘Level of Service’ study for pedestrians to figure out how bad the problems are. Did you read the news item where the BBMP Commissioner, Mr Subramanya, has gone on record, saying, “Only God can help the pedestrians”? SGN, you have done a great writeup. I sincerely appreciate this comprehensive compilation by you.